Removing clothing stains is one of the main reasons people seek the help of their dry cleaner. With their special solvents, equipment, and training, dry cleaners can remove some of the most disastrous-looking stains with relative ease. 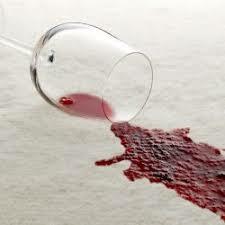 Successful stain removal depends largely on the nature of the stain, the type of fabric, and the color fastness of the dye. Ink stains and dried paint, for example, can be impossible to remove. Also, some fabrics and dyes are not made to withstand the use of cleaning or stain removal agents. Never put a garment away with spills or stains on it. The warmth of a closet and exposure to natural or artificial light and to the atmosphere can contribute to setting a stain. Bring in a stained garment as soon as possible, preferably within a few days, to prevent the stain from setting. Do not attempt home spot removal with either water or a cleaning fluid without testing first for color fastness Wet an unexposed area, such as an inside seam, and blot with a clean cotton towel or gauze to make sure the color is fast. Never rub a stain, especially when attempting to remove a stain from silk. Blot the stained area with an absorbent dry cloth underneath. This will help remove the staining substance without spreading the stain and will avoid damaging the fabric. Inform your dry cleaner of the location of specific stains and any procedures you have used to remove them, even if the stains are no longer visible. Butter - Butter is an oily substance which can best be removed in the dry cleaning process. However, for light stains, pre-treat with a liquid laundry detergent. Place the stain face down on clean paper towels. Apply liquid detergent to the back of stain. Replace paper towels frequently. Allow air dry, then rinse Launder in hottest water safe for that fabric. Before drying, inspect the fabric, and repeat the treatment and washing if the stain remains Not recommended for silks. clean paper towels and press with a warm iron. Replace paper towels frequently to absorb more wax and to prevent transferring the stain. Place stain face down on clean paper towels. Sponge the remaining stain with "Shout" or "Spray and Wash", blot with paper towels. Let dry, then launder. Note: If any color remains, re-launder with a bleach that is safer for the fabric. Cheese/Cream Sauce - Fresh stains should be soaked and agitated in cold water before washing. If stain is dried or old, scrape or brush off any crusted matter and soak for up to several hours in cold water, using a detergent or an enzyme solvent. Launder in warm (not hot) water. If stain remains, soak an additional 30 minutes and re-wash.
Chocolate - A dry cleaner can pre-treat your garment to easily remove this stain in the dry cleaning process. As a home remedy, treat the stain with a pre-wash spray or pre-treat with a product containing enzymes. Launder. If stain remains, re-launder with a bleach that is safe for the fabric. 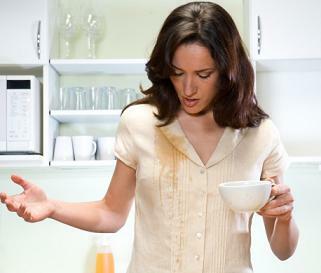 Coffee - (plain or with sugar/sweetener) - Your professional dry cleaner will use a tannin remover before cleaning. In an emergency situation, flush stain immediately with cool water or soak for 30 minutes in cool water. Blot, don't rub, the stain with detergent and launder. Launder with bleach that is safe for the fabric. Do not use soap (bar, flake, or detergents containing natural soap), since soap can make a stain permanent. With cream - Cream is an oily substance that is best removed by dry cleaning. For a home remedy,flush stain immediately with cool water if possible or soak for 30 minutes in cool water. Sponge stain with a dry cleaning solvent. Air dry. Blot, don't rub, with detergent, then launder with bleach that is safe for the fabric. Do not use soap (bar, flake, or detergents containing natural soap), since soap could make a stain permanent or at least more difficult to remove. Pre-Treat and soak older stains with an enzyme product, then launder. Not recommended for silks or rayon. Cooking Oil - Light stains can be pretreated with a spray stain remover, liquid laundry detergent, or a detergent booster. Place heavy stains face down on clean paper towels. Apply cleaning liquid to the back of stain. Replace towels frequently. Let air dry, rinse. Launder in hottest water safe for that fabric. Before drying, inspect, and repeat the treatment and washing if the stain remains. Dye Stains - Dye stains can be very difficult to remove. Soak the garment in a diluted solution of an all-fabric bleach, but check the garment care label for color fastness first. If use of bleach is acceptable, soak, then rinse. If the stain remains and the garment is colorfast, soak the entire garment in a diluted solution of liquid chlorine bleach and water. Caution: Chlorine bleach may change the color of the garment or cause irreversible damage. Therefore, it is important to check for color fastness before using. If the stain does not come out within 15 minutes of bleaching, it cannot be removed by bleaching, and any further exposure to bleach will weaken the fabric. To check for color fastness to liquid chlorine bleach, mix 1 tablespoon of bleach with 1/4 cup of water. Use an eyedropper to put a drop of this solution on a hidden seam or pocket edge inside the garment. Let it stand two minute, then blot dry. If there is no color change it is safe to use the product. Bleaches have directions for doing color fastness tests. There are a number of dye removers, such as one from "Rit", which are available in drug and grocery stores. However, dye removers can take out fabric colors as well as the stain. Gravy - Treat the stain with a pre-wash spray or pre-treat with a product containing enzymes. Launder. If stain remains, re-launder with bleach that is safe for the fabric. Ink(solvent soluble) - Ink stains can be difficult to impossible to remove. This stain is best removed by a professional dry cleaner. However, if you must try it yourself, you generally need to act fast to have a chance. Sponge the area around the stain with alcohol before applying it directly on the stain. Next, place the stain face down on clean, white, paper towels. Apply alcohol to the back of the stain. Replace towels frequently. Continue until no further ink is removed. Then rinse thoroughly. Rub with heavy duty liquid detergent and launder in hottest water safe for fabric, with a strong bleach safe for fabrics. Instead of alcohol, you could try using dry cleaning solvent, such as Carbona, Energine, or Goddard's. (Be sure to read and follow the instructions on the product label. These products are toxic) Also, try a hidden inside seam first, to be sure the garment dye won't be removed. Some inks on white fabric may be removed with a dye stripper. You should be able to find this in areas where package dyes are sold. For stains on colored fabrics, check for dye stability in a hidden area before using. Ink (permanent) - Permanent inks are almost impossible to remove. This stain is best attempted by a professional dry cleaner. However, if you must try it yourself, you generally need to act fast to have a chance. The first step is to force water through the stain before it dries to remove excess ink. Allow to dry. Sponge the stain with dry cleaning solvent (read the directions carefully, it is toxic). Allow the fabric to dry. Work a liquid detergent into the stain with your finger. Rinse. Soak the stain in warm water with 1 to 4 tablespoons of household ammonia. Rinse and repeat if stain is lessening. Launder. Some inks on white fabric may be removed with a dye stripper. Follow package instructions. For stains on colored fabrics, check for dye fastness in a hidden area before using. Lipstick - Place face down on paper towels. Sponge area with dry cleaning solvent, or use a pre-wash soil and stain remover. Replace towels frequently; rinse. Work light-duty liquid detergent into the stain until outline is removed. Launder. Repeat treatment if needed, using an all-fabric bleach, because it is less damaging to colors and fabric. Use liquid chlorine bleach for tough stains, if fabrics are colorfast to bleach. Make-up - Place face down on paper towels. Sponge area with dry cleaning solvent, or use a pre-wash soil and stain remover. Replace towels frequently; and rinse. Work light-duty liquid detergent into the stain until outline is removed. Launder. Repeat treatment if needed using an all-fabric bleach, because it is less damaging to colors and fabric. Use liquid chlorine bleach for tough stains, if fabrics are colorfast to bleach. Mildew - Mildew is a growing organism that must have warmth, darkness, and moisture to survive. Mildew actually eats cellulose fiber and can also damage manufactured fibers, causing permanent damage and weakening of fibers and fabrics. To treat mildew first brush or shake off mildewed area. Pre treat stain with heavy-duty liquid detergent. Then launder in hot water with heavy duty detergent and bleach safe for fabric. Let dry in the sun. Badly mildewed fabric may be damaged beyond repair. Old stains may respond to flushing with dry cleaning fluid, i.e., Carbona, Energine, Goddard's (but, carefully read and follow the instructions on the label, these are extremely toxic). Milk - Fresh stains should be soaked and agitated in cold water before washing. If stain is dried or old, scrape or bush off the crusted matter and soak in cold water using a detergent or an enzyme pre-soak. Launder in warm (not hot) water. If stain remains, soak an additional 30 minutes and rewash. On dry clean only items, see your local dry cleaner. Nail Polish - For stains from nail polish, apply nail polish remover to the back of the stain while laying the fabric on white absorbent towels. Replace towels frequently. Then rinse and launder. Never use nail polish remover on acetate, triacetate or modacrylic, as they will dissolve. Odors - Your professional dry cleaner can remove most odors in the normal process of dry cleaning. For washable garments, most odors should be removed by normal laundering. For stubborn odors sprinkle the clothes with baking soda, let stand, and then vacuum and Launder. Perspiration - Perspiration, if allowed to stay in fabric, will permanently stain and weaken the fabric. Aluminum chlorides in antiperspirants will also weaken the fabric under the arms. Controlled use of antiperspirants and frequent washings immediately after wear can minimize this type of damage. Wearing an undershirt or perspiration pads, can also keep stains off your shirts or blouses. These types of stains can be difficult to remove. The buildup of aluminum chloride or zinc salts may be impossible to remove. Old stains are more difficult to treat because they have been set, particularly from being heated in the dryer. For washable fabric, treat light stains with a liquid detergent and then launder. Pre-treat heavy stains with a pre-wash stain remover. Allow to stand 5 to 10 minutes. Launder using an all-fabric bleach. If fabric has discolored, you might try treating fresh stains with ammonia and old stains with vinegar. Rust - Removing rust stains can be difficult. Rust stains cannot be removed in normal laundering. Your professional dry cleaners has access to rust removing chemicals that are not available to the consumer. Small stains may be removed with a few drops of a retail rust remover. Follow package instructions. Do not let dry between applications. Rinse thoroughly and launder with a liquid laundry detergent and oxygen bleach, following directions. Do not use chlorine bleach, chlorine bleach will make the stains permanent. Salad Dressing (oil-based) - Most oil-based stains can be easily removed by your professional dry cleaner. In an emergency, light stains can be pre-treated with a spray stain remover, liquid laundry detergent, or a detergent booster. Place heavy stains face down on clean paper towels. Apply cleaning liquid to the back of stain. Replace paper towels frequently. Rinse. Let air dry for a few minutes. Launder in hottest water safe for that fabric. Before drying, inspect, and repeat the treatment and washing if the stain remains. Smoke, Soot - Your dry cleaner has special odor-neutralizing chemicals to make your garments smell clean and fresh. At home, shake off excess soot outdoors. Launder in washing machine using a heavy-duty phosphate-based detergent or heavy-duty liquid detergent - as recommended by manufacturer, one cup of water conditioner, and 1/2 cup of all-fabric bleach. Use water setting appropriate for the fabric. Air dry. Inspect for smoke odor. Repeat as necessary. Three or four washes may be needed for cottons and cotton blends. Tar - Don't try to remove this stain at home. Dry cleaners have solvents to dissolve tar that are not available for home use. Tea - (plain or with sugar/sweetener) - Your professional dry cleaner will use a tannin remover before cleaning. In an emergency situation, flush stain immediately with cool water; or soak for 30 minutes in cool water. Blot, don't rub, the stain with detergent, then launder. Launder with bleach that is safe for the fabric. Do not use soap (bar, flake, or detergents containing natural soap), since soap can make the stain permanent. With cream - Cream is an oily substance that is best removed by dry cleaning. For a home remedy, flush stain immediately with cool water if possible; or soak for 30 minutes in cool water. Sponge stain with a dry cleaning solvent. Air dry. Blot, don't rub, with detergent, then launder with bleach that is safe for the fabric. Do not use soap (bar, flake, or detergents containing natural soap), since soap could make the stain permanent or at least more difficult to remove. Pre treat or soak older stains with an enzyme product, then launder. Urine - If the care label in your garment says Dry clean-only, do not attempt a home remedy. On washable fabrics, soak stain in cool water. Pre treat with pre-wash stain remover, liquid laundry detergent, or a paste of powdered detergent and water. Launder in hottest water safe for the fabric, using a bleach safe for that fabric. Do not use soap (bar, flake, or detergents containing natural soap), since soap could make stain permanent or at least more difficult to remove. Wine - Your dry cleaner uses special chemicals to remove the tannin found in red wine from your garments. At home, soak stain in cool water. Pre treat with pre-wash stain remover, liquid laundry detergent, or a paste of powdered detergent and water. Launder in hottest water safe for the fabric, using a bleach safe for that fabric. Do not use soap (bar, flake, or detergents containing natural soap), since soap could make stain permanent or at least more difficult to remove. Note: Older stains might respond better to treatment with an enzyme product, than regular laundering. These are all general tips intended to guide you through the prevention of permanent stains using common household items. Come and visit us to get the best treatment on the garments, with the appropriate solvents and chemicals.